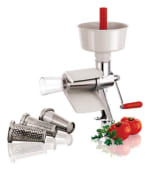 The Paderno 42576-00 tomato juicer has stainless steel moving parts that will not corrode over time after juicing acidic product. For stability, a clamp holds the unit upright on workstations. Staff can feed tomatoes into the removable hopper at the top and crank the arm to create juice and pulp. Get additional information on juicers from our juicers article.